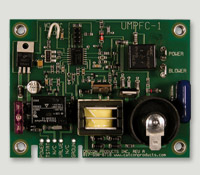 UNIVERSAL IGNITER BOARD WITH FAN CONTROL Model: UMPFC-1 Replaces Suburban, Hydro-Flame and Fan 50 Control Boards. Can be used to add fan control feature to standard furnace. Part # 500-00021-05 UMPFC-1 Universal Igniter Board with Fan Control Features: • Fuse protection • Remote flame sense • 3-try fire routine • 20 sec fire delay with 20 second purge between fire cycles • BI-color LED, Green when board is powered, Red when gas valve is energized, Flashing Green when 3-tries have occurred with no flame • Checks for shorted electrode prior to firing. If electrode is shorted board will not fire and will continually flash LED Green 5 times. • Fan Control Model protects battery in the event flame out occurs. Warranty Catcon Products Inc. will warranty the MicroPulse Universal Igniter for a period of 5 years. In the event of a failure Catcon Products Inc. will repair or replace board at no charge. This warranty does not cover labor or the appliance.